Last Friday’s very weak German Manufacturing Purchasing Managers’ Index data was another blow to the global economic backdrop, with concerns throughout this year of a global slowdown in China, through Asia Pacific and increasingly also in Europe. This has seen riskier asset classes come under negative forces over the past week into latter March, with global equity averages suffering notable corrective losses as we have shifted to a “risk off” phase. Furthermore, a very dovish Federal Reserve at their 20th March Meeting has seen longer term US Treasury (UST) yields plunge back lower and an inversion of the 3 months-10yr sector of the UST yield curve. This yield curve inversion is often seen as a sign of a future recession. In the Forex space, the main beneficiary of this shift to a “risk off” scenario has naturally been the Japanese Yen with its quality as a safe haven. 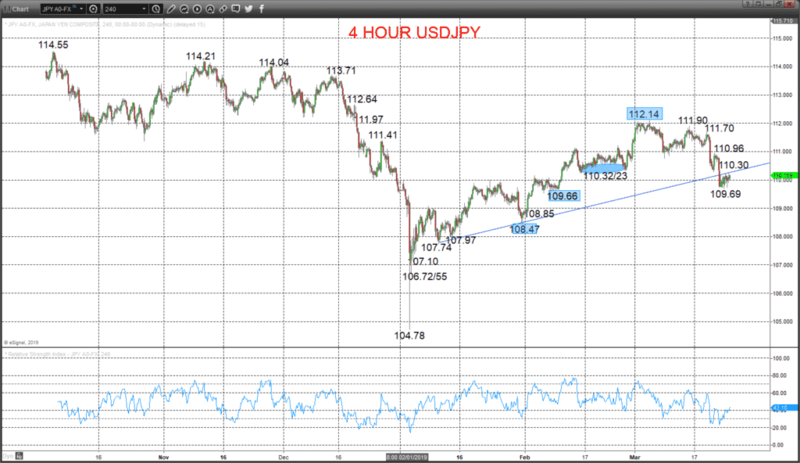 The Yen has rallied against most major currencies over the past week, and here we focus on the USDJPY move lower and downside risks. A minor rebound Monday but contained by our initial, modest 110.30 resistance level, sustaining bear forces from the Friday push close to a key 109.66 support (to 109.66) after Wednesday’s post-FOMC selloff through the 110.32/23 support area (to signal a topping pattern), to aim lower into Tuesday. The latter March approach to the key 109.66 support level, alongside the reversal of the 2019 up trend produced a shift from an intermediate-term bulky trend to an intermediate-term range, we see as 108.47 to 112.14. We see a downside bias for 109.69/66; break here aims for 109.23 and 108.85. But above 110.30 opens risk up to 110.96. Intermediate-term Range Breakout Parameters: Range seen as 108.47 to 112.14. Upside Risks: Above 112.14sets a bull trend to aim for 113.71, 114.55 and 115.00. Downside Risks: Below 108.47 sees a bear trend to target 107.74, 106.72/55 and 105.00.